Yeti rides: The ice road that was not. 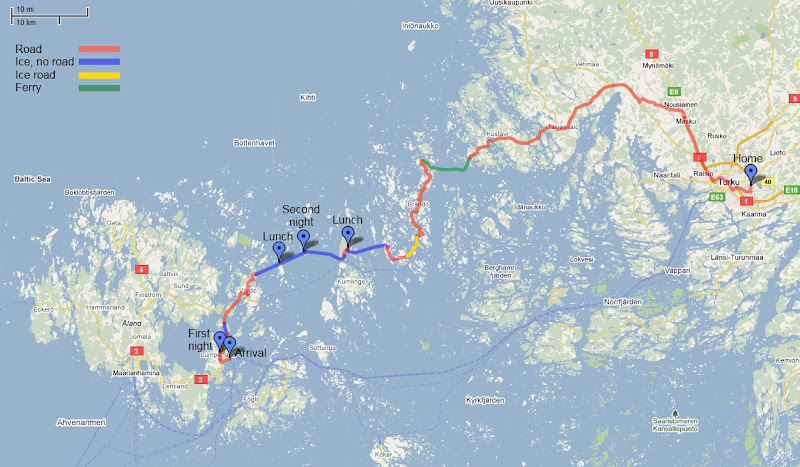 For quite some time now we have had plans for riding the ice roads between the Åland Islands and Turku by bike. For this to succeed a very cold winter is needed. Last winter did not, according to our information, have good enough ice. This winter started out very promising, but a warmer period did not inspire much hope. The ice cover and thickness still grew all the time and the weather cooled down. Currently the ice cover of the Baltic Sea is the largest since 1987, so the time had finally come. There is no detailed information about the the ice road routes available online, but we managed to get enough information from a few people on Åland and I want to thank them for that. There are two links of interest on the internet: Bosse Ahlnäs from Åland maintains some information on his home page and then there's the ice road trip on bike from 2003 by Konstantin Shemyak. We planned to ride the following route: Vårdö-Enklinge-Lappo-Torsholma-Houtskär-Rymättylä, which is about the longest route available from Åland (Vårdö) to Turku. Our plan also included sunny and not to windy weather. Two days earlier this would have been possible, but our trip was to be something entirely different. We got boat tickets fron Turku to Långnäs on Åland (Lumparland) for Thursday night. I rode the 30 minute ride to the harbour, where I met Toni. We had a cold wait for our turn to get aboard. Some carbohydrate and fat loading on the boat. The boat left us at 01:45 in the night. We rode a few kilometers and pitched the tent to grab a few hours of sleep. Note that the everyman's right is more restricted on Åland than in the rest of the Nordic countries. Strictly speaking pitching the tent like this is not allowed. We took care to be out of sight, though, and except for some imprints on the snow there is no trace of our visit. The next morning. The wind increased considerably during the night, just as the weather forecast said. We came prepared for this, however. On the move again a little after eight in the morning. It was around -7ºC(20ºF) in the air. The ferry to from Lumparland to Ängö. In some places the ice won't freeze strong enough to carry cars due to currents. Not a good start for our first ice section. The tire tracks from Ängö to Mickelsö was completely unrideable. 3 km of rather hard bike pushing was ahead. It took about one hour. Even with a fat bike it was not possible to ride. The snow was hard enough to give a lot of resistance, and soft enough not to carry the bike. Arriving at a plowed road on Mickelsö. ...but soon became unrideable due to snowdrift. Note the map and compass in front of the handlebar. We were prepared to handle whiteout. We continued to push our bikes. It was very hard work, since the feet sank into the snow for every step. Our speed was around 2 kilometers per hour. The wind was already quite strong, but came mostly from behind. The visibility soon sank to about 1 km. We followed some faint tire tracks, which according to the compass led in the right direction. We decided to take lunch at around 13 o'clock on a small island next to Ledsöra. Melting water for food and drinking. This is were we made a small mistake. Despite trying to shelter the stove from the wind, it took an eternity and and lot of fuel to melt the necessary amount of water. By pitching the tent we would have both won time and saved fuel. After the lunch another 2.5 hours of bike pushing followed. At this point there was no land to be seen anywhere. At 17.00 it was clear that we would not be able to cross Delet (Teili) before it would become dark. For a moment we considered continuing, but that brain lapse quickly passed. We confirmed our position by GPS and decided to go to a nearby island which had a little forest, Notskär, in the middle of Delet. Since the wind was now quite strong and it snowed a little we searched for a sheltered spot on the small island. We found a good spot on the leeward side of the island and pitched our tent there. Not much else to do than to rest, eat and make drinking water. The tent spot was actually a little too sheltered, since it became pretty humid inside. During the night the wind was very hard, though, so our tent spot still made sense. The next morning we got up at 5:45 to eat breakfast, make drinking water and contemplate our possibilities. We decided to turn back to Vårdö, since with the conditions of yesterday the trip would take several days to complete. On the move again a little before eight in the morning. To our relief, the visibility was now excellent (more than 10 km). To our surprise, the ice was rideable again. The only explanation I can think of is that the hard wind of the night forced the snow into snowdrifts, leaving other spots bare. There were long bare spots in the SW-NE direction of the wind. It was possible to ride eastwards by searching out these bare spots. A straight line it was not, we probably rode three times the straight distance. With this information at our hands, we decided to continue towards Enklinge after all. Note the greyer areas. Those are the bare spots that are rideable. There was an advantage to the fat tires and stability of the Pugsley at this point. Since we still had to force occasional snowdrifts, I broke trail making it easier for Toni to follow on his narrower tires. Soon at Enklinge. The ferry for Kumlinge just left. We visited the shop on Enklinge to buy some different chokolate than we already had. When the chokolate and energy bars provide most of the energy to keep you going, some variety in taste is nice. The rumor of our arrival had already reach the shop, and the shopkeeper kindly invited us to eat a little snack inside. He was impressed by the fat tires of the Pugsley. Continuing from Enklinge, the ice road started out fine for maybe one hundred meters. We continued riding from one bare spot to another, something made possible also by the good visibility. It would probably be impossible to keep the direction by compass only when riding in this way. We rode straight (well, not really) from Enklinge to Björkö, to try to find a plowed road. Our first attempt took us to a road, but it had not been plowed at all this winter. The second attempt was more successful, after going through some deep snow. The ferry between Korso and Lappo. The ice doesn't look that thick here. Judging by the bike, the Lappo guest harbor is not that frequented during the winter season. We went to the nearby shop to ask for water and got a kind reception even though it was closed. The shop keeper gave us a bag of buns for energy. To our surprise, the ice road from Lappo to Torsholma was actually plowed just earlier. The 6 km went very rapidly with tailwind. What a joy and sense of speed! From Torsholma we should have continued towards Houtskär according to our original plan. The uncertainty of the ice roads and late time of the day made us decide for another route instead. We rode from Torsholma to Åva on the roads and bridges connecting the islands of the Brändö archipelago. Riding on roads is easy, but at the same time allows you to to really push yourself hard, which takes its toll. The boat from Åva to Vuosnainen (Osnäs) was to leave at 17:30 and we arrived with 40 minutes to spare. Refilling the energy supply in the waiting room. The boat trip took 40 minutes and they actually served food on the boat. Toni is starting to look a little tired. Now we only had 80 km of road riding left, probably the most dangerous part of the trip. This last leg of the trip was mostly pure suffering. At one point we had to take a short detour, since we ran out of drinking water a long time ago. Melting more water would have taken at least 30 minutes more, so we opted to ride to a service station. At this point we had a very rough time, with Toni being a bit stronger. After something to drink and eat at the service station, we recovered some of our energy, and the last 30 km went well. We pushed ourselves pretty hard this day and had almost 14 hours of actual riding time, arriving at 01:00 on the Sunday side of the night. Despite not going according to our original plans, this trip became very memorable. This was the most demanding trip I've done on bike. It is nice to notice the personal comfort zone growing. Despite harsh conditions we were always in control of the situation and could enjoy the trip. Thanks Toni for coming with me on this one! And here is Toni's preliminary writeup. Here is the approximate route, though the route we rode on ice was far from this straight. Only one ice section was a plowed ice road. The map does not show the landing sites accurately (for several reasons) and they often change anyway, so don't rely on them unless you are willing to push a bike through snow. Remember that the ice road may become unpassable within a short time if the wind picks up. Your trip reports open up a very new kind of winter hiking world to me. Thanks again! Cool adventure! Not too many people are capable of finishing these kind of trips. Awesome ride Peter! geez..I can see how this one would be memorable for you!...good job! and thanks for sharing! Impressive is all I can say! Wow, that ride is just incredible. I have done a little snow riding, but this is a whole other world in comparison. Quite an adventure. Way cool. Thanks for great pictures. Do you have also the one showing the route ridden? I'm impressed! Greetings from Lappo. WoW! Otrolig trip - ni är verklige extreme guys. Shopkeeper på Lappo är min kusins fru! you are very welcome for the buns, good to hear that you got home safely an d as I said before you are welcome any time! Maria, living in Finland you should embrace the snow and cold. Martinsillo, I don't think snow shoes would help and it would probably be even harder to push the bikes wearing snowshoes. Wilhelmiina, thank you once more. I´m speechless...congratulations to both of you! It must have been very demanding adventure! Despite the harsh conditions you succeeded to keep things in control and change plans depending on situation. Man get older, but wiser too! Respect to both of you! Great report of a fun (and difficult looking) trip Peter! Do you think with similar conditions and the knowledge gained from this attempt you'd be able to bag the whole thing someday? And how are the pugsley tyres on the ice vs what I presume are Nokian ice spikes on Tonis bike? Ian, a new attempt would of course be interesting, but the opportunities are quite rare. The previous winter it was possible was 2003. A few day after we made our trip (and a few days before it as well) it would probably have been possible without too much difficulties. A few days later still, the situation changed for the worse with lots of water on the ice and now the ice road season is over. The Pugsley was not necessary on this trip, but I still think it is a valid choice. The conditions could be such that the fat tires would give a big advantage and the only negative side is a slightly higher rolling resistance on really hard ice and asphalt. The tires gripped well on the fairly uneven ice. On really smooth ice the studded tires on Toni's bike would have been much better, but we did not encounter that. Vow! Very, very impressive trip! A whole new dimension to winter outings in my opinion. At least that kind of trips are not too usual in Finland. Thanks, Jaakko. The camping was comfortable enough, but with no extra camping clothes and shoes there is not much else to do than rest in the tent. Good enough for this kind of trips, but maybe not for a weeklong trip. The space is a premium on a bike, more so than the weight in fact, but I think that there would have been space for a week's food but not much more. Any colder weather and I would have needed a second sleeping pad as well, so there really is not much space for luxury stuff.